Old games October continued tonight, but oddly enough it turned into party game October. About the Game on! Game Night: We meet on the 1st and 3rd Tuesdays (plus the occasional 5th Tuesday) of the month at Avon United Methodist Church from 6:30-9:30. The next game night will be on October 29th. The Game On! Game Con is coming! Along with a lot of open gaming, there will be select event and tournaments. We will also have a silent auction to benefit a local charitable organization. All are welcome! The night got started off with this flavor of deck building. The game technically is not old, but the theme is so it kind of counts for Old Game October. Despite knowing nothing about Star Trek David pulled off a strong win. Actually, I think the scores might have been inverse to actual Star Trek knowledge. Horses ran, people bet (do you bet in this game? ), and someone ended up in the winner's circle. There was no pretense to qualify this one for Old Games October, people just wanted to play the new hotness. John and Greg both own the game, but Kalen won. Dan brought a play test/demo copy of this new party game from looney labs. Cody was clearly best at choosing one, and ambivalence about drinking holidays is clearly frowned upon. We played a 10 player game of this popular party game. However, due to time we decided to cut it short after the first round. That is probably for the best because I am not sure how to gesture Prairie Home Companion. After Time's Up, we played three game's of Werewolf. I moderated one and Cody moderated two. In the first game the werewolf had a good go, but when it got down to the last few was found out by the seer. 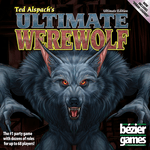 In the second game the werewolf was caught in the second round. The third round went down to the wire with only three people left and the werewolf getting caught. The Hooligan was still alive, and the two targets were dead making the hooligan the winner.